Delegates and members from around the country discussed the growing push to war being led by the Trump administration and backed enthusiastically by Theresa May’s government. The conference provided some in-depth analysis of the situation in the Middle East, the Asia Pacific, and Britain’s growing involvement in a series of wars. It also agreed that given the desperately dangerous situation, we need to strengthen and grow our organisation as a matter of urgency. A series of action points for groups were discussed. Here are some of them. Make sure every group is out campaigning. Obvious things to do at the moment are to use the petition against Trump’s push to war or to end the special relationship. But be imaginative and ambitious – try organising a street meeting around breaking with Trump’s foreign policy for example. Put on an election hustings with your local candidates taking questions about issues related to war. Organise regular public meetings and briefings. Obvious subjects include No to Trump’s drive to war. A short history of the special relationship and why we should end it. Britain’s seven secret wars: Why we need a new foreign policy. Put on cultural/music events. Anti-war film showings are very popular at the moment. Our Stop the War film screenings at Sands Film Studios in London are a big hit. We Are Many screenings always draw a crowd. Last Friday more than 400 people packed a Drop Bass Not Bombs rave in Peckham. Upcoming in London is a night of readings of Howard Zinn and others at the Park Theatre. Put on similar events where you are. Recruit people to Stop the War. We need to grow our networks fast. Getting new members helps to involve new activists in organising and provides much needed resources for the office. 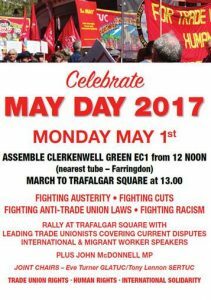 All friends and comrades meet up at 11am at Hendon Station to get to the demonstration. FACK Statement on the Prosecution of Crossrail construction companies 12 April 2017, Westminster Magistrates Court, 18 Marylebone Road, London NW1 5BR. On 12th April at Westminster Magistrates Court, three companies are being prosecuted for the death of one worker and the injury of two others workers on Crossrail: BAM Nuttall Limited, Ferrovial Agroman (UK) Ltd, and Keir Infrastructure and Overseas Ltd. 1. They are being prosecuted in relation to three incidents that took place during the construction of the new Crossrail railway tunnel construction, which runs east to west across London. All three companies will to face four charges each. Two relating to the death of Rene Tka’cik on the 7 March 2014, and one each relating to injuries to Terrence Hughes on the 16 January, and Alex Vizitiu on 22 January 2015. Rene Tka’cik died after he was crushed by falling concrete on the 7 March 2014 while working on the Fisher Street cross-over tunnel. Almost all deaths and injuries at work are due to employers’ mismanagement and these three companies are being prosecuted for alleged breaches of health and safety law. There have been many reports of health and safety mismanagement of companies working on Cross Rail from blacklisting for reporting health and safety issues that went on to seriously hurt other workers, for poor welfare facilities –workers having to walk miles for a toilet.. It is completely unacceptable in 2017 that large construction companies can neglect workers health, safety and welfare and all employers must be held to account for the sake of justice for those killed and harmed, their families, and for deterrence: to stop other employers corporate killing. Owing to tomorrow being Maunday Thursday, we will be meeting in the Bohemia Pub at 7pm, instead of the Greek Cypriot Brotherhood. All individual members with up-to-date subscriptions can register for the conference. 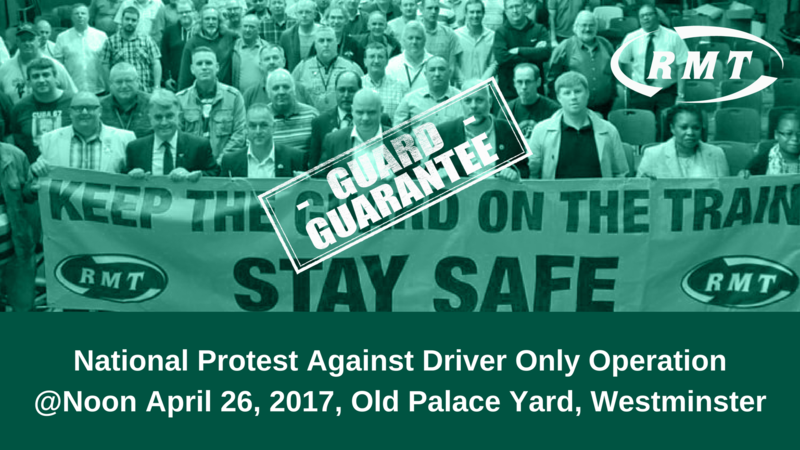 The date for the new members to join and attend the conference has now passed. We will be writing to all our members individually to invite them to the conference and remind them when their membership fees are due. Please call us on 02075614830 if you would like to discuss membership and registration. Local groups can nominate four delegates. 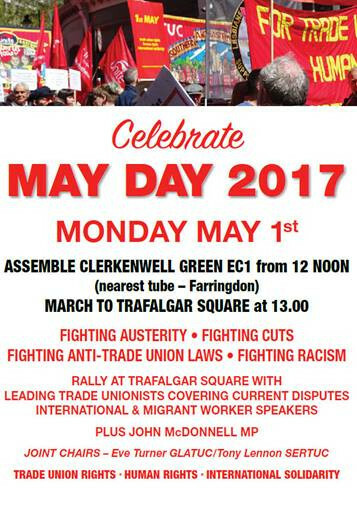 Trade union branches, trades councils, community and faith groups who have up to date affiliations can nominate two delegates. 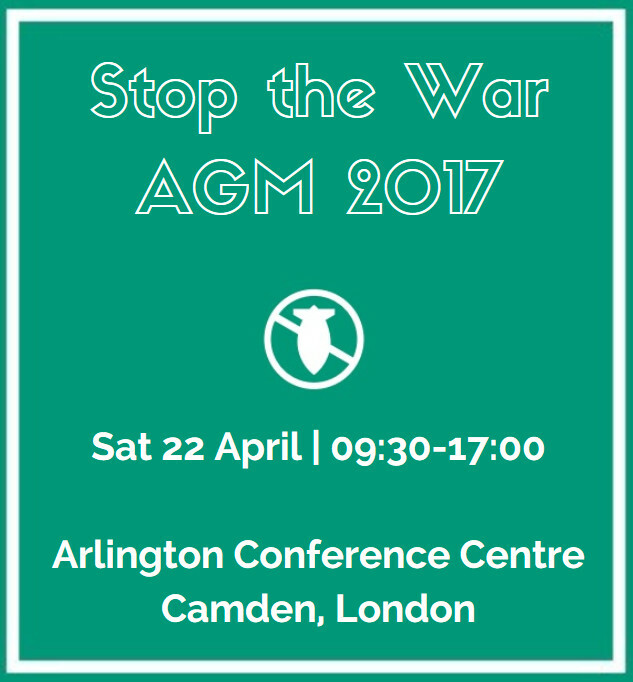 Local groups and affiliated organisations are permitted to submit one motion to be decided upon by Stop the War members and delegates. This is the fixed list of steering committee members from affiliated groups other than local groups. Existing steering committee members are listed on the Stop the War web site. The new list will be elected at the AGM. 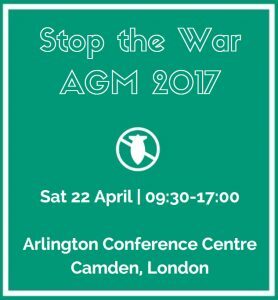 Delegates for local Stop the War groups are decided by local groups themselves so nominations are not required. We will be meeting at the Greek Cypriot Centre in North Finchley this Thursday the 13th as usual. The Barnet Alliance for Public Services will be having their own meeting at 6.30pm beforehand. Help us launch the London Renters Union! We’re aiming to launch the London Renters Union before the end of 2017. Help us raise the final funds we need to hire a Project Coordinator! We all know London’s housing system is broken. It is fuelling inequality and wrenching families and communities apart. It is delivering windfall gains to landlords and investors, while trapping millions of people in the insecure private rented sector, forcing them to live with the constant threat of rent hikes or eviction. Sky-high house prices and a lack of social housing mean that by 2025, a majority of Londoners will be long-term private renters. London renters have higher rents and fewer rights than anywhere else in Europe, and rents are rising much faster than average wages – Londoners are now spending, on average, two-thirds of their earnings on rent. But it doesn’t have to be this way. The Renters Power Project is in the early stages of setting up a union that will fight with and for private renters, a union that can build the power we need to secure a fairer deal for London’s renters. 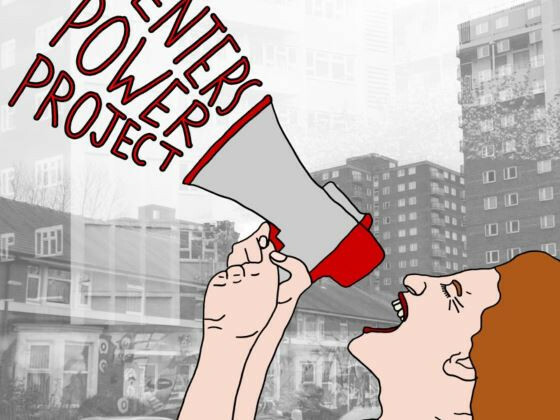 Renters Power Project has arisen from cooperation between Generation Rent, Digs (Hackney Renters), Take Back The City, the Radical Housing Network and Advice4Renters. 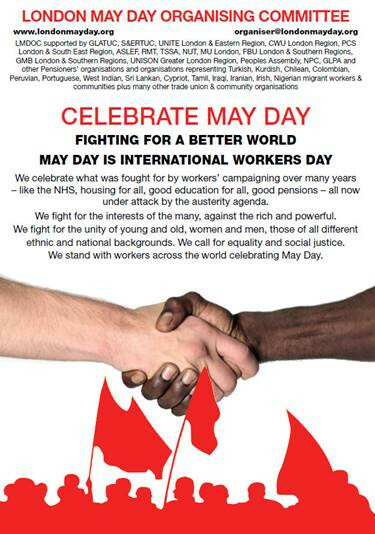 We’re working closely with organisations like Acorn and the New Economy Organisers Network. In January 2017 we held a launch event and we now have the support of over 50 housing and community groups from across the city. We plan to launch in affiliation with the national Renters Rising project. But we need your help to take the next step. The project is growing every day, and we need to raise the funds to hire a paid Project Coordinator, two days a week. We’re a third of the way towards our funding target, which would enable us to employ someone on Living Wage for two days a week for 6 months. Help us raise the rest! Our ambitions for the project are huge, as is its potential. The Coordinator will take on vital administrative and development work for the project, helping us take the next step to setting up a fighting, member-led union that represents London’s renters in all their diversity. We don’t just want your money – we need you to get involved! A union that listens to and empowers London renters can only happen with your input. To get involved in developing our strategy and demands, or in our outreach, communications and fundraising working groups please contact renterspowerproject@gmail.com. If you want to find out more about the Renters Power Project, or keep up with what we’re up to, like us, follow us and check out our website! You can sign-up to our mailing list here. Fabulous buffet dinner, live bouzouki music, a raffle. Reports from the latest GSC delegation to Athens. Send cheques for ‘Medical Aid for Greece’, to Greece Solidarity Campaign, Housman’s Bookshop, 5 Caledonian Road, London N1 9DX.